The day was indeed uncomplicated, & sleep was untroubled until the first logging truck roared onto the dirt road just across from my campsite at 5 a.m. I’ve changed sites for tonight. I woke up to find everything in the tent damp from condensation. Very unpleasant, but not surprising. This muggy weather stays overnight, even though the heat takes a break for a few hours. Tonight, I’ll cram into a plastic garbage bag all items that will fit. The heat really took a lot out of me today. I was such a sweaty mess when I got back from the border that I got cleaned up & changed as soon as I returned to camp, even though the day was far from over. T-shirt & shorts & the indispensable socks are hanging to dry after a good rinse in spring water. I MADE IT!!! I’ve reached the northern end of the Cohos Trail. I crossed into Canada long enough to enjoy a snack on the hill overlooking Chartierville. I got here with NO northbound shuttles past Sportsman’s Lodge, on my own two blistered feet, through rain & heat & pavement & rocks & weeds. I did it, I did it, I did it. I’m 50 years old, and I’ve just had a dream come true that would never have occurred to me at 40. And I have had so much fun in the process that it’s just plain ridiculous. Amid all this lofty prose, the tent ceiling is drooping AGAIN. That’ll keep me humble. Conditions for today’s hike were the same as yesterday’s, & the moose are still avoiding US 3 in the heat of the day. As I passed Third Lake, a coyote howled over & over from somewhere on the other side. I heard a loon somewhere out there as well. These were the only sounds – no traffic at those moments. The border crossings were quick & uneventful. I stopped on the US side to confirm that I could get back in with my passport. 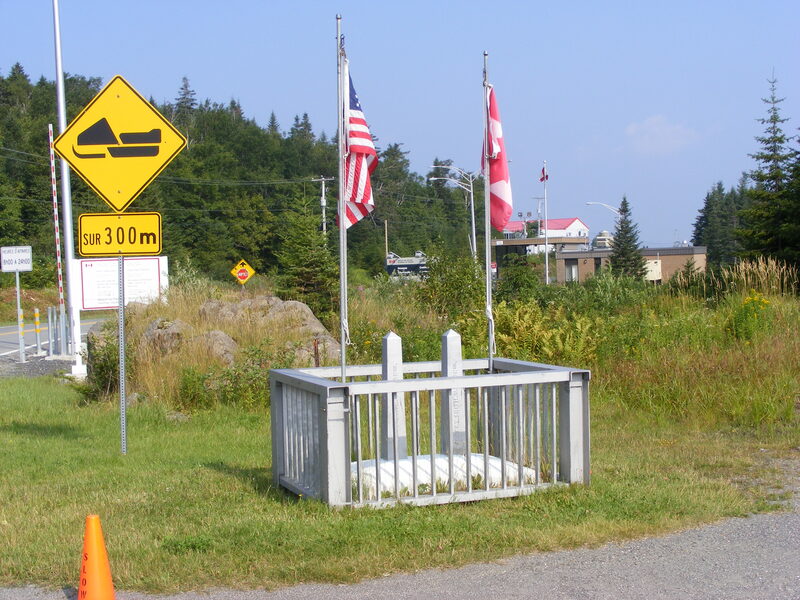 I then walked to Canadian customs, stopping to photograph the boundary monument. I’m sorry no one was around to take a picture of me standing there. This was not a place to seek help from the border agents. Very serious men, every one. I can usually elicit a smile from people. Not these guys. At the Canadian station, I discovered – oh, the letdown! The disappointment! – that they had no need to stamp my passport. The document therefore still looks unused. Stamp or not, though, I couldn’t have entered Canada or returned to the US without it. Glad I brought it. Upon seeing my lunch bag & my trekking pole, and probably getting a whiff of my unshowered body as well, the Canadian agent nodded at my request to cross over for a short walk. Looking at the posted list of prohibited items, I quickly added that I was carrying a jackknife. That almost drew a smile from the agent – a ghost of a smile was in there somewhere. He saw no need to inspect my little bag, and he sent me on my way. I have been told that it’s amazing to cross into Quebec from NH because of the abrupt change from forest to farmland. Turns out that’s absolutely true. The view from the border is really quite striking: US 3 becomes Rt. 257, and it heads straight north to Chartierville, three miles away – downhill all the way in one gentle rolling drop after another. The day was too hazy for any good photo of this scene. Little town, lots of farmland, lots of signs in French: welcome to Quebec. I decided after seeing that downhill road that I was not going to check out Chartierville. The trip back would have been time-consuming and, quite frankly, a drain on my legs, and I still had 4th Lake on the day’s agenda. Instead, I found a picnic area in a small meadow just past the border station, with three shaded picnic tables & a tourist kiosk & view to the north. I took out my water & my snack & enjoyed my 15 minutes of international travel right there. The meadow was full of energetic cedar waxwings, flying from trees to meadow to picnic tables in search of worms or insects or whatever it is they live on. The heat wasn’t slowing them down a bit. They kept me quite entertained, though I was too slow to get good pictures. I never knew they could hover, but hover they did when examining a promising patch of ground. Back to the USA. 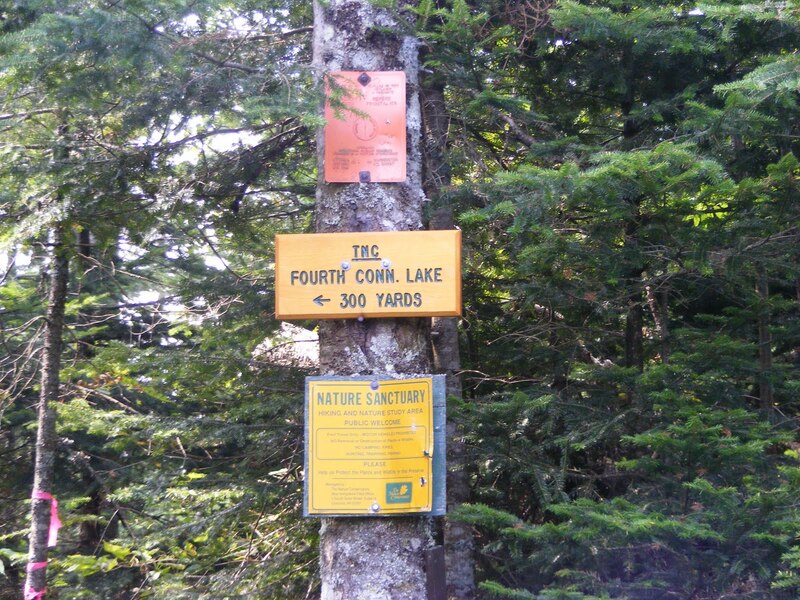 I told the agent I wanted to go on the 4th Connecticut Lake trail, and he waved me toward it. Within about 2 minutes, I was very glad I hadn’t gone to Chartierville & back. This little trail went up a few hundred feet in seven-tenths of a mile. 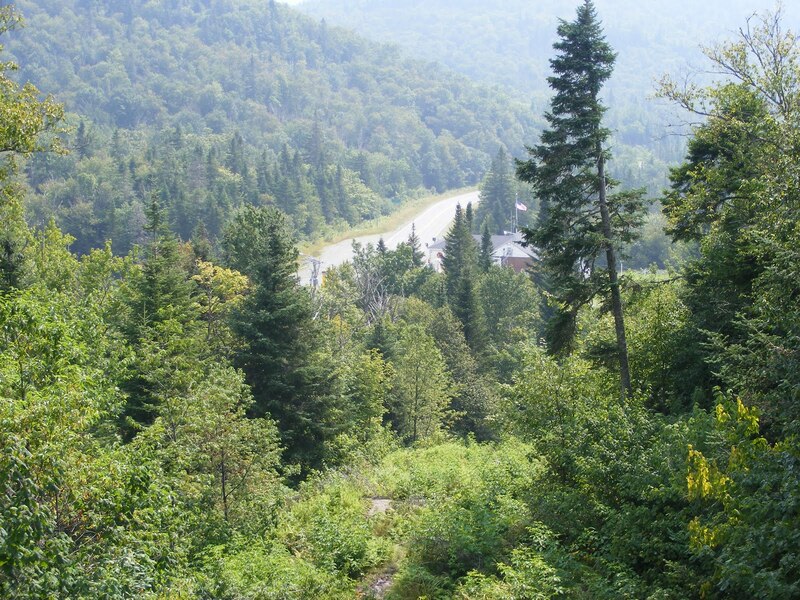 One of the photos attached to this post shows the view down to the border station from about halfway up the trail. Wherever it wasn’t rocky, it was muddy. I needed the trekking pole, especially on the way down. But … I got there! Fourth Lake is a peaceful, unassuming little bog. It’s a marvel to think of the lakes I’ve seen on this trip all starting out here. The walk back to camp in the afternoon was anticlimactic. I was hot & lethargic, & I went through my water much too fast. There’s a little unmarked pullout at 3rd Lake where small boats can put in. I stopped there to sit by the shore & cool off for awhile. I soaked my bandanna in the chilly water & then tied it around my neck. Heavenly. (That bandanna has been really good to have on this trip.) A couple from Florida sat nearby with their 3 dogs. The largest of the 3 was Mick, a boisterous creature who liked chasing his little Frisbee into the water. With the owners’ OK, I tossed the toy into the lake again & again, & Mick splashed right in to retrieve it & dog-paddle back to shore for another round. He would shake off cold water all over me after every retrieval. I loved it. Back to US3, grinding it out one step at a time. I promised my kids I’d do no hitchhiking, and never was that promise more sorely tested than today. I behaved myself, though, and returned to Deer Mountain under my own power. I stopped at the spring at the park entrance to refill my water bottle, and I drank a third of it down in one long pull. No rest for the weary just yet. I was determined to change my campsite to avoid another 5 a.m. logging-truck wakeup call. I’m now just a stone’s throw away from the ranger’s office & house. I’ll bet logging trucks don’t wake HIM up at 5. Relocated & freshened up by 3:30 in the afternoon, I dropped onto my sleeping pad & slept for an hour. A breeze blowing through the tent was a big help. When I woke up, I felt thoroughly refreshed, though really hungry. I put a good dent in the contents of the bear box, washing it all down with water. Delightful. It’s 7:30 p.m. now, & I miss having a book, & I’m picturing my family watching Jeopardy. Today’s reading material has consisted of tourist brochures too bland to keep as souvenirs. If I can’t read, I can write, & this keeps me occupied in camp. Ooohh, I can feel the air mucking up again. Tent fly off, mesh wide open: let’s hope that keeps the humidity at bay.